LUSAS Civil & Structural software is available in three software product levels with additional software options available for purchase to meet your particular needs. Civil & Structural LT is suitable for linear static analysis of structural frames and grillages. Civil & Structural is suitable for everyday linear static and linear dynamic analysis using beam, shell, solid and joint elements. Civil & Structural Plus includes an extended advanced high-performance element library and allows for more advanced analyses to be undertaken. All software is fully integrated and easily upgradeable. Software options are available for some of these products and are listed at the bottom of the detailed specification listings for each product. Which product and which options do I need? The detailed specification for each product lists the main features and capabilities of each product. A table of products and options is also provided to assist with your LUSAS Civil & Structural software product and software option selection for a particular modelling or analysis task. For all types of general analysis with beam, shell, solid and joint elements. 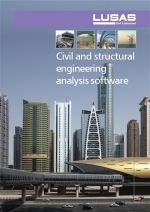 Includes all of the elements, material models, modelling, analysis and results processing capabilities of LUSAS Civil & Structural LT.
* when used with the appropriate software option(s) Includes all of the elements, material models, modelling, analysis and results capabilities of LUSAS Civil & Structural LT.
Also has an extended advanced element. Model and results files created by a lower product (such as Civil & Structural LT) can be viewed and edited by a higher product version (such as Civil & Structural). Model and results files created in a higher product can be opened for viewing or editing in a lower product version provided the model contains only those elements and analysis options supported by the lower product. LUSAS model and results data can only be read in a particular software release version when it was written by a version with the same or lower 'major' version (such as V14 or V15), and also the same or lower 'point' release version (such as V14.5 or V14.6).